Walking Mountains Science Center and special guests from John McConnell Math and Science Center of Western Colorado will host Code Cracking: Spy Science on Saturday, Nov. 5, from 2 to 4 p.m.
What: Code Cracking: Spy Science. When: 2 to 4 p.m. Saturday, Nov. 5. Cost: $10 per child (targeted to third- through eighth-graders). More information: Registration is required; call 970-827-9725, or click on “Spy Science” at www.walkingmountains.org/fun. AVON — When you’re a spy, your main job is to find out information and pass it on to the person who needs it most. In wartime, this may be a general or the president. If spying for money, the spy might pass on the information to his or her boss. Either way, getting caught isn’t an option. Spies that are caught during a war can be put in jail or even killed. Other spies will almost certainly have similar consequences. For this reason, spies use secret ways to communicate, known as codes. They do this to protect the information and to protect themselves. A code is essentially a secret language invented to conceal the meaning of a message. 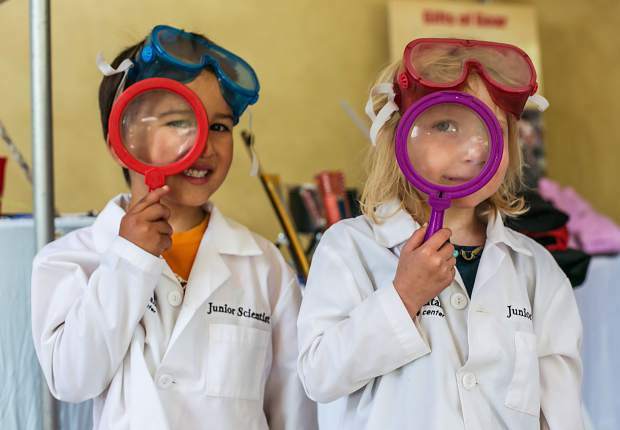 Walking Mountains Science Center and special guests from John McConnell Math and Science Center of Western Colorado on Saturday from 2 to 4 p.m. will host an afternoon spent channeling your inner spy. From writing code, to code breaking, participants will learn the skills that would give 007 a run for his money. Participants will learn the basics of cryptanalysis to write their own codes and practice breaking other codes. End the day with a challenge of skill, as attendees are locked in a room and must use only their brains to escape. Different types of codes have been used throughout history whenever people wanted to keep messages private. Using code in World War I played a key role in helping the United States Army win several battles in France that brought about the end of the war. These successes led to the recruitment of Navajo American Indian Code Talkers in World War II to develop a code within their language. At Camp Pendleton, the Navajos, in addition to their other duties, were required to devise a new Marine Corps military code, which, when transmitted in their own language, would completely baffle their Japanese enemies. The code’s words had to be short, easy to learn and quick to recall. After working long and hard on the project, the men devised a two-part code. The first part, a 26-letter phonetic alphabet, used Navajo names for 18 animals or birds, plus the words ice for I, nut for N, quiver for Q, Ute for U, victor for V, cross for X, yucca for Y and zinc for Z. The second part consisted of a 211-word English vocabulary and the Navajo equivalents. This code, when compared with conventional Marine Corps codes, offered considerable savings in time, since the latter involved lengthy encoding and deciphering procedures by Signal Corps cryptographic personnel using sophisticated electronic equipment. On the battlefield, the work of sending coded messages was extremely serious. Code Talkers had to transmit their messages with the utmost care and accuracy under difficult circumstances. Being able to keep messages secret could mean the difference between winning and losing a battle — or affect how many lives were saved or lost. Eventually, Navajo code talkers served with all six Marine divisions in the Pacific and with Marine Raider and parachute units, as well. Praise for their work was virtually endless, as they participated in major Marine assaults on the Solomons, the Marianas, Peleliu and Iwo Jima. As a result, their work saved countless lives and helped the United States achieve many victories. John McConnell Math and Science Center of Western Colorado is a nonprofit organization based in Grand Junction. Its mission is to inspire a passion and respect for math and science in communities, fulfilled by providing hands-on experiments and interactive presentations that demonstrate math and science concepts to all ages.